Give me a call to set up your custom fishing guide trip to catch some of these trophy size monsters. I offer reasonable rates and a satisfying fishing experience. I supply fishing equipment, safety gear, snacks, soft drinks, and also send photos of your trophy catch. 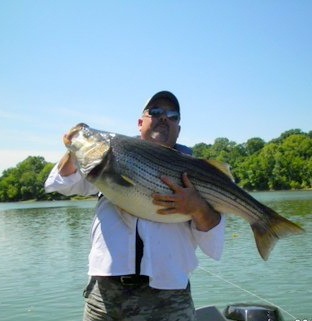 We also can arrange to have your fish mounted, but we prefer to take pictures of your catch and release. A $100 dollar deposit per day is required to hold your reservation. A full refund with a 10 day notice of cancellation. A state fishing license is required. Please book your trip well in advance, if possible. 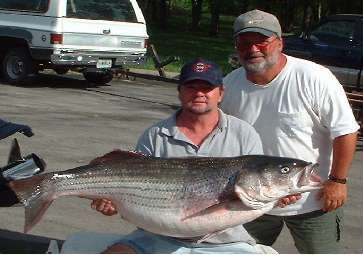 Lets go for that Tennessee state Striper record that is now just 65 1/2 pounds!! Lets try to break it this year.